DigiTech today announced the introduction of its BP355 Bass Multi-Effects Pedal, a modeling bass processor that offers bass players hundreds of sounds, amp and speaker cabinet models, effects and much more. Powered by DigiTech's leading-edge AudioDNA®2 processor, the BP355 offers state-of-the-art modeling of 20 amps, 17 speaker cabinets and more than 70 different effects -- distortion pedals, flangers, phasers, chorus pedals, envelope filters, compressors, delays, pitch shifters and more, including a selection of industry-standard Lexicon® reverbs and popular stompboxes. The BP355 includes 70 factory and 70 user presets, a Tone Library with 30 sounds and an Effects Library with 30 effects. A choice of 3-band or 4-band semi-parametric EQ enables precise tonal adjustment. The DigiTech BP355 is ideal for practicing and rehearsing. It includes 60 CD-quality drum patterns, an audio input for a portable audio player, and a 20-second looper that players can play along with. It even has a built-in tuner. All of the BP355's sounds and functions are easily accessible via its straightforward control layout and three footswitches, and the BP355's expression pedal enables on-the-fly control of volume, pitch, modulation speed and other parameters. The BP355 has a rugged, die-cast metal housing that stands up to on-stage use, while its USB connectivity and included Cubase® LE5 recording software and DigiTech X-Edit™ editing software make it perfect for home or studio recording. The BP355 has a 1/4-inch input and 1/4-inch and XLR stereo outputs, an Amp/Mixer switch that enables connection to an amplifier or a PA system, a 1/8-inch external audio input, 1/8-inch headphones output and a USB jack. Its power supply is included. With the BP355, bass players have all the sounds they need to take center stage, with a pedal that offers more sounds, effects and versatility than ever. 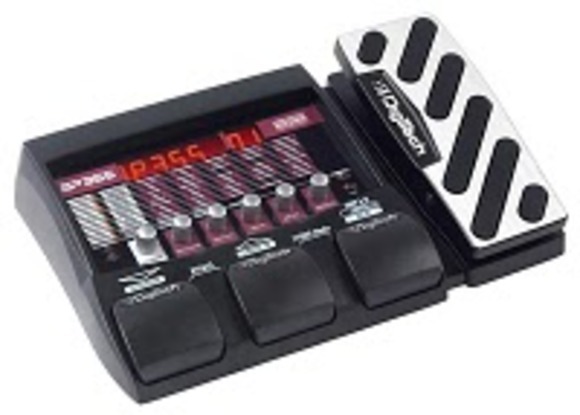 The DigiTech BP355 Bass Multi-Effects Pedal will be available in December 2010 at $309.95 suggested retail and $199.95 MAP. Please visit digitech.com for more information.